Murky Muk! Pokemon One a Day! Man, only 15 minutes till the day's over...But I'm not losing this streak yet! The only reason I like Muk is because Ash had one and it was both a decent fighter and overall friendly character that was lovable despite its appearance. Other than that, Muk is pretty disappoint as an evo, but makes sense at the most basic level of how a goopy, dripping, slimey abomination of pollution might evolve. If Grimer is able to produce on its own by splitting its form further down, what would happen when pools of Grimer merge together? Muk! Kinda like Digletts and Magneton, in a way. Or, I would imagine when a Grimer consumes enough waste, litter, garbage, smog, etc., the cesspool of bacteria reach a new level of toxicity and changes its structure accordingly, creating a new type of goop that could differentiate itself from Grimer. Either way, the end result is going to look nasty...and for something made up of what smells like death, looks very alive. Thus, I wanted strands of goo coming down a general shape. This is the basis of Muk, and I use that verticality to build the look and feel seen here. Muk seen in this illustration has a defined form and a thick silhouette that doesn't really convey the runniness of the slop and goo. Instead, the motion is captured within the frigid frame. This creates a look that is both clean and messy, and is more of an abstract take on something supposed to be revolting. I used varying brush lines to differentiate the trails of purple to make sure the image could "breathe a bit more". The next things to focus on were the eyes and the mouth. Green is also a color we associate "goo" with (Nickelodeon, anyone?) but this neon green is more symbolic of anything radioactive. I went with a greenish tongue to contrast against all the purple, adding an acidic element to make the Pokemon feel more dangerous. 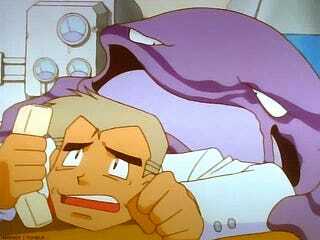 The red eyes are also given to Muk to make it appear more sinister. 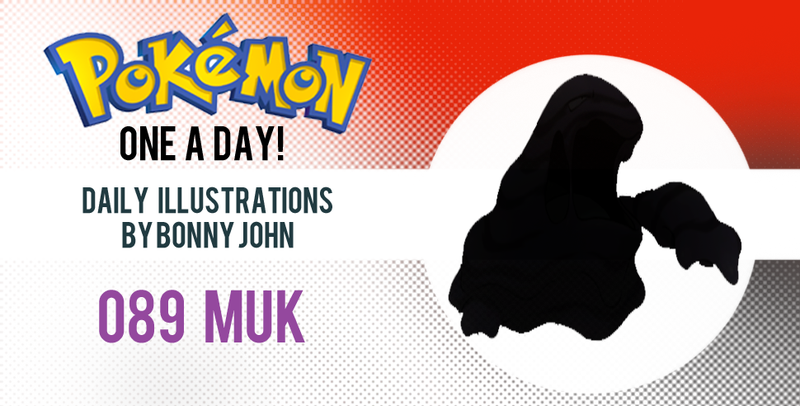 Imagine finding a Muk trudging towards you in a dark alleyway at night with glowing red eyes! So yeah, that wraps up the art for today and for the weekend! Thank you very much for always giving me and my work a chance. Hope you liked the artwork and found this write up helpful in getting a closer look at how this piece came to be. Enjoy your weekend!